Like ‘The Creature from the Pit’ before it, ‘Nightmare of Eden’ has a mixed reputation among fans as it once more asks viewers to accept obvious shortcomings in the script and production as it attempts to get across its very worthy message at a time when drugs and addiction were at the forefront of the public consciousness. Beginning with the core mystery of who is behind the drug operation, ‘Nightmare of Eden’ makes no attempt to divert attention away from the obvious culprit being Tryst, a mad scientist that actor Lewis Fander sadly takes to near-pantomime extremes. The script actually does a good job in explaining the character’s weak motivations and pathetic justifications after an effective actual reveal, but the performance takes away any true emotional punch. Sadly the excise men, Fisk and Costa, fare little better with unfortunate dialogue and equally-pompous performances from Peter Craze and Geoffrey Hinsliff. Of course, some stories suffer from the realization of practical and special effects more than others, and ‘Nightmare of Eden’ certainly has issues on those fronts. The Mandrels, as is so often case, are a fearful menace in concept, and the deadly results of their actions before being revealed build them up as such. Unfortunately, the hulking creatures physically do little to continue that threat once the costumes are actually revealed in the light. Likewise, the opening shot of the ship in space leaves much to be desired. However, there is still a lot to like about this tale, especially with the moral about drugs being an intrinsic part of the plot without ever becoming overly intrusive. The Doctor’s first-hand knowledge of the effects Vraxion can have on planets and cultures lends an immense air of gravity to the current threat as well, and although the forest and ship settings are not as strong as in some other stories, the atmosphere created and technical effects used as the story progresses into Eden are very well done. Regardless of the ultimate outcome, though, it’s hard to fault the ambition of the Doctor Who staff for trying to do something new with the franchise, and the overt inclusion of drugs and even the storytelling device of the two ships sticking together undoubtedly achieve that goal. ‘Nightmare of Eden’ is a story that will reward those who sit through it to the end and are able to once more look past some dodgy effects and supporting performances. This is a tale brimming with surprising turns, and the third episode is especially strong as the story finally begins to coalesce. Truly, this is a tale that celebrates the best and the worst of the classic era; the imagination and creativity on display is top-notch, but the budget and some supporting performances are sadly circumspect. 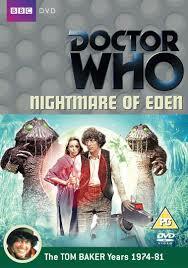 Even with Tom Baker and Lalla Ward giving peak performances, ‘Nightmare of Eden’ had a bit of a troubled time during production, and due credit must be given to those involved for still churning out such an enjoyable tale that is so surprising while remaining so straightforward.